Hi everyone! For this video tutorial I decided to do something very simple, very doable and easy to mass produce if needed. 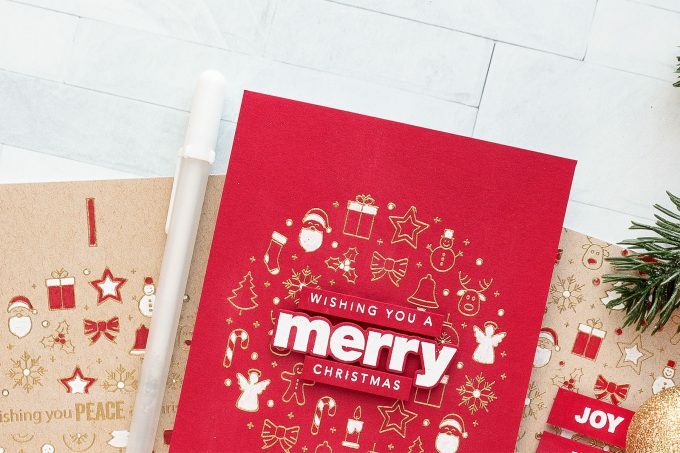 I’m sharing Clean & Simple Christmas cards that require little to no coloring using a single pen or a pencil. 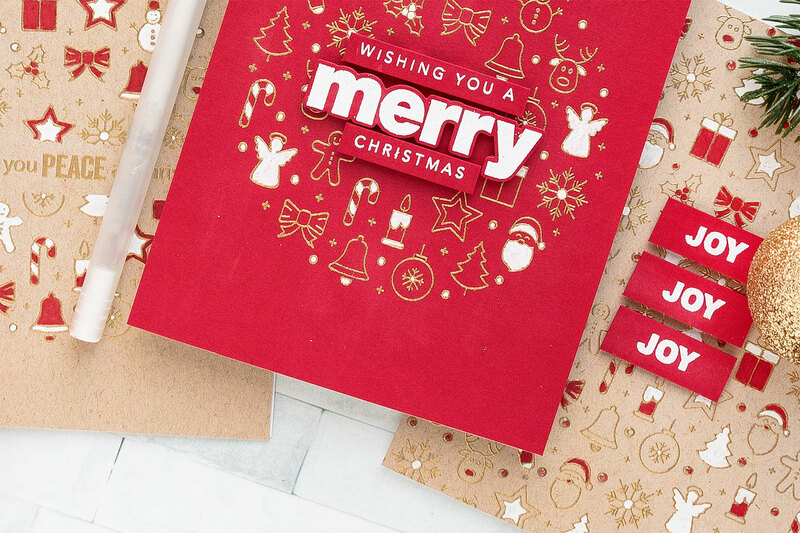 I haven’t yet decided on the design of my Christmas cards this year, but these might be just it – they are easy to make, they are almost one layer and they pack a lot of wow into a simple design. 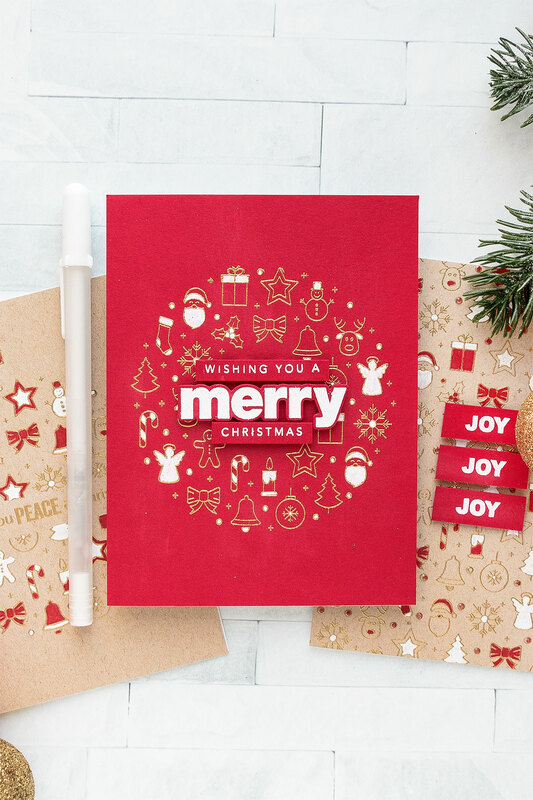 I started making these cards by heat embossing either an entire background, a middle section only or middle and inner sections in Gold embossing powder on kraft or red cardstock. The beauty (and value!) or this background stamp is that it can be used in 3 different ways without much effort. Next, I used a single white pen or red pencil or combination of both to color select icons on the background. I used just white pen to color the wreath on the red background. I only colored some icons, you definitely don’t want to color them all (you can if you want to). For my kraft cards I used a combination of white pen and Deep Scarlet Red, #219 Polychromos pencil from Faber Castell and colored some icons white, some red and some both white and red (like candy canes and gift boxes). I added very simple sentiments onto each of my 5 backgrounds, some cards ended up being one layer, some simple 2-layer with either a Holiday or regular Thank You sentiment. Thanks for sharing your great cards! I love seeing hearing your thought process, and seeing your designs come to life on video! 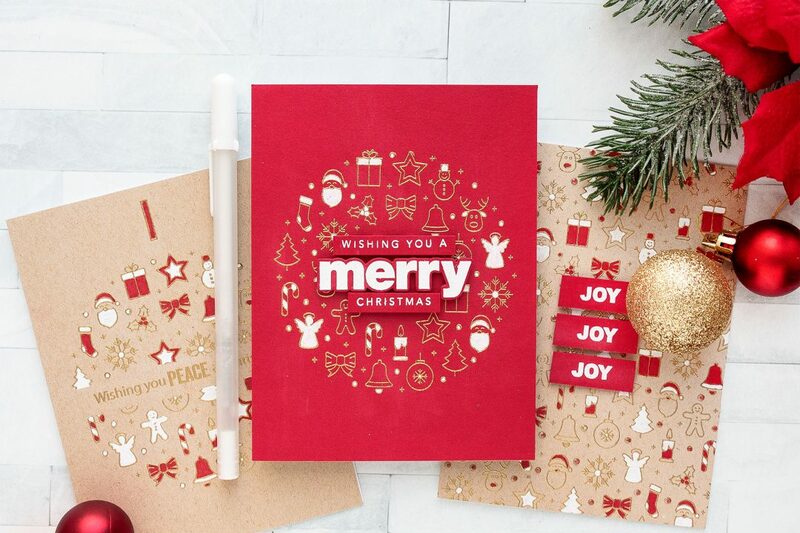 Totally fell in love with the Merry card – that red on red is fabulous! Striking cards — I love a red and white combo. I especially like the card where the icons are in a circle and you masked off the center for the sentiment. Recently I bought my first background stamp and am learning what can be done with it. Not sure I want to invest in more of them … yet. However, this background stamp has lots of possibilities. 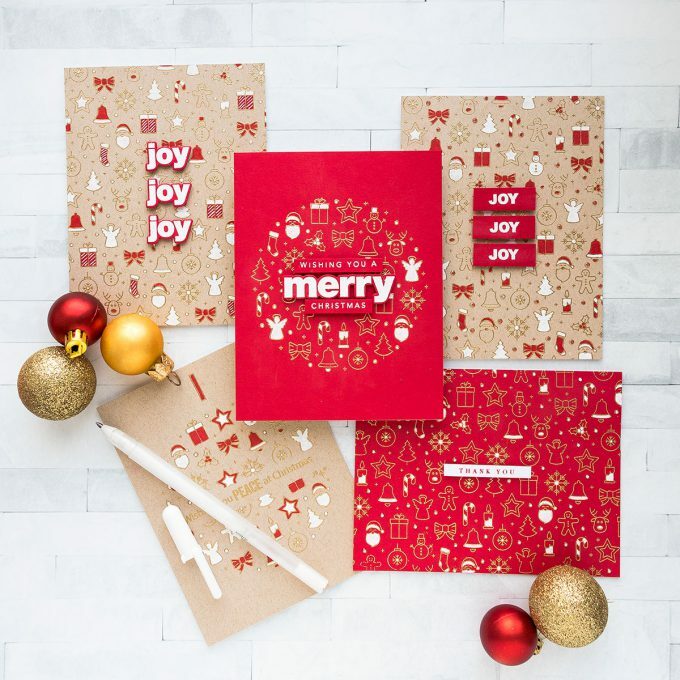 Thanks too for the reminder to make some holiday thank you cards!!!! Thank you, Yana! Always such a treat to open my mail from, Yana! I always wonder what surprise she has waiting for me and she never fails to deliver! Great stamp and wonderful way to use it! Thanks so much for your ideas and inspiration! I love the red and gold. To me that just screams Christmas. Great job, Yana. Hi Yana, such fabulous cards. I love the simplicity of these cards but they are gorgeous! I enjoy watching your videos. Your cards are always very inspiring. I totally missed this background stamp when the products were first revealed. Just wow! Love, love, love these cards. Great card ideas. I’m going to try this with smaller stamps I have and create my own background. Beautiful cards and proof again that simple is so gorgeous! What a great idea! love your cards, thank you for sharing. I just love these cards! So stunning. I agree would be a great pick for sending out christmas cards this year! Love these cards! That simple coloring with the heat embossing really works well. I hadn’t planned on ordering this stamp until I saw your cards. Now it’s definitely going to be a must have. Really like that with this simple idea I can mass produce plus do my coloring while on the go or while watching TV. I love these cards and I ordered the stamp because of what you created. I do have a question, did you stamp on the actual card or did you stamp on a piece of card stock and then attach it to a card base? thank you, Denise! Glad you like them! I usually stamp on a piece of cardstock and then adhered it onto my card base. Helps with warping if I have any from heat embossing.